Dorothea Lange was one of several professional photographers hired by the government to document the plight of rural poverty in Depression-era America. Lange’s work on behalf of the Farm Security Administration (FSA) effectively humanized the epic scope of the Dust Bowl. The FSA, created in 1937 as part of FDR’s New Deal, sought to ameliorate widespread and devastating poverty by funding farm development programs and “rural rehabilitation” for the nation’s dispossessed. The striking images produced by Lange and other FSA photographers brought much public attention to daily hardships faced by displaced sharecroppers, migrant workers, and Americans whose tragedies had been largely invisible. The five brothers had enlisted in the Navy on January 3, 1942 and requested to serve together. Four died during the attack on the Juneau. The fifth, George Thomas, made it onto a life raft where he survived for five days before succumbing either to wounds and exhaustion or a shark attack. 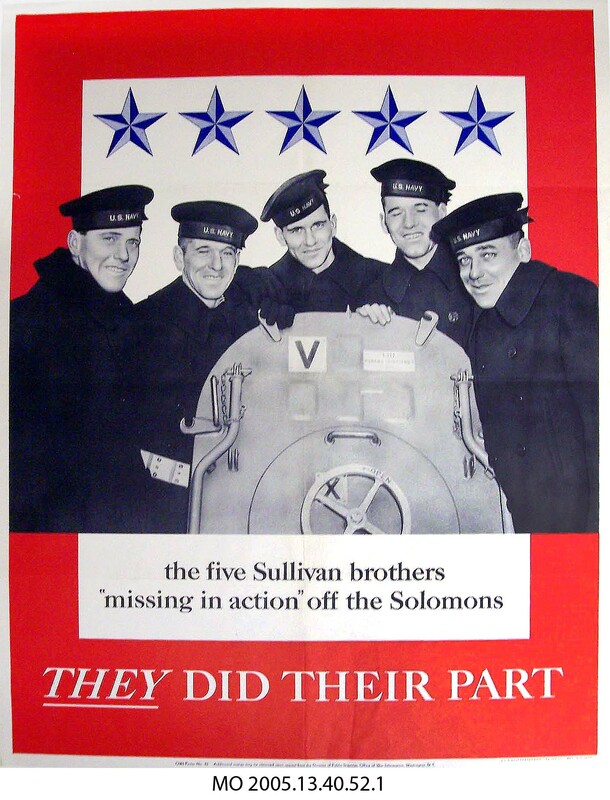 The story of the Sullivan brothers quickly became the focus of national attention and efforts to rally Americans around the war effort. This government poster commemorated the heroism and sacrifice of the men and their family. The photograph on the poster depicts the boys aboard the Juneau. 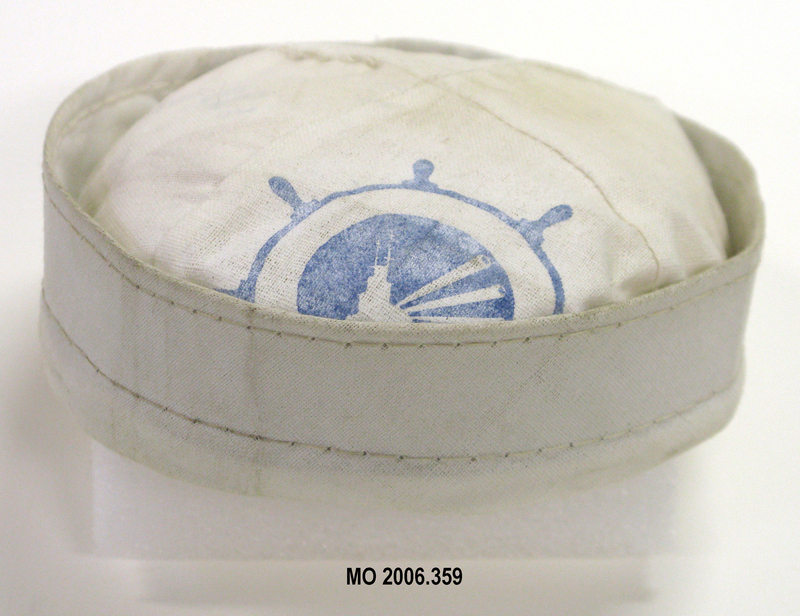 There are five blue stars along the top, one star for each brother. On this Memorial Day, we remember and honor those brave men and women who have served and died in defense of our country. “HOUSTON—I am in Texas for two lectures on behalf of Bonds for Israel and arrived in Houston when a court hearing was being held on the speed for compliance with the Supreme Court’s order on desegregation of schools. This led the press to ask me a number of questions which, as a guest, I felt it was unfortunate for me to have to answer, particularly since I feel that my attitude and beliefs on this question have been so well known. I was glad, however, to be able to express my strong feelings against violence in this issue anywhere in our country. And so I regret the decision made in Texas against the National Association for the Advancement of Colored People, for it seems to take away the right to use legal action to enforce the desegregation decision and, in a way, makes it more difficult to prevent violence. I hope that I am wrong and that we will see a continuation of the staunchness shown by the citizens in Montgomery, Ala., who under the leadership of the Rev. Martin Luther King have adhered to non-violence. May 27, 1935: The Supreme Court declares the National Industrial Recovery Act unconstitutional. On May 28, 1934 FDR reviewed the fleet off the entrance to the New York harbor while aboard the USS Indianapolis. The fleet consisted of 81 warships, a naval line that stretched for 12 miles, which took 90 minutes to pass. 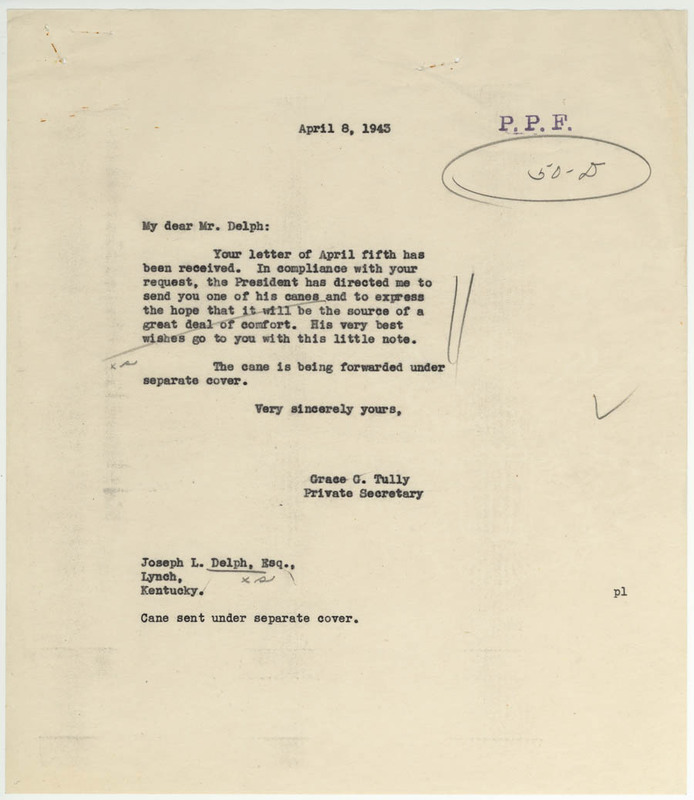 On May 28, 1942 FDR sent greetings to Yank on the publication of its first issue. Yank was an army weekly magazine whose editorial staff consisted entirely of enlisted men. On May 27, 1943, FDR issued an executive order establishing the Office of War Mobilization. All four of Franklin and Eleanor Roosevelt’s sons served in America’s armed forces during World War II. Elliott Roosevelt was the first Roosevelt son to enter the military. FDR was very proud of his son and visited him in training camp. Elliott later wrote that when FDR learned he had enlisted, he saluted him with a heartfelt toast: “To Elliott. He’s the first of the family to think seriously enough, and soberly enough, about the threat to America to join his country’s armed forces. We’re all very proud of him. I’m the proudest.” (As He Saw It, Elliott Roosevelt). 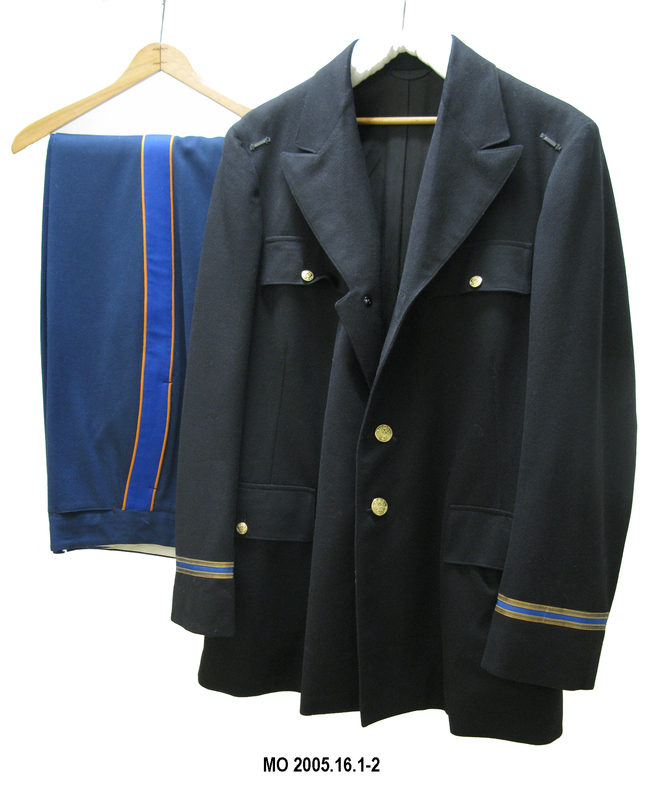 This is Elliott Roosevelt’s service dress uniform from when he was a captain in the Army Air Corps. The uniform consists of a black wool, fully lined, single-breasted jacket with double pockets on each breast and brass buttons, each with a U.S. seal. A maker’s tag on the left pocket reads: “The Lilley-Ames Co. of Columbus, Ohio.” Handwritten in ink on the tag is “Capt. Elliott Roosevelt”. Each sleeve has blue and gold bands at the ends. Also included are navy blue pants with royal blue and orange stripes running down each leg. “NEW YORK, Wednesday—…While I was on the Tex and Jinx show I was given the news of the unanimous Supreme Court decision that wiped out segregation in the schools. I am delighted this was a unanimous decision because I think it will be difficult for the states with segregated school systems to hold out against such a ruling. If it were not for the fact that segregation in itself means inequality, the old rule of giving equal facilities might have gone on satisfying our sense of justice for a long time. It is very difficult, however, to ensure real equality under a segregated system, and the mere fact that you cannot move freely anywhere in your country and be as acceptable everywhere as your neighbor creates an inequality. May 18, 1933: The Tennessee Valley Authority was created. 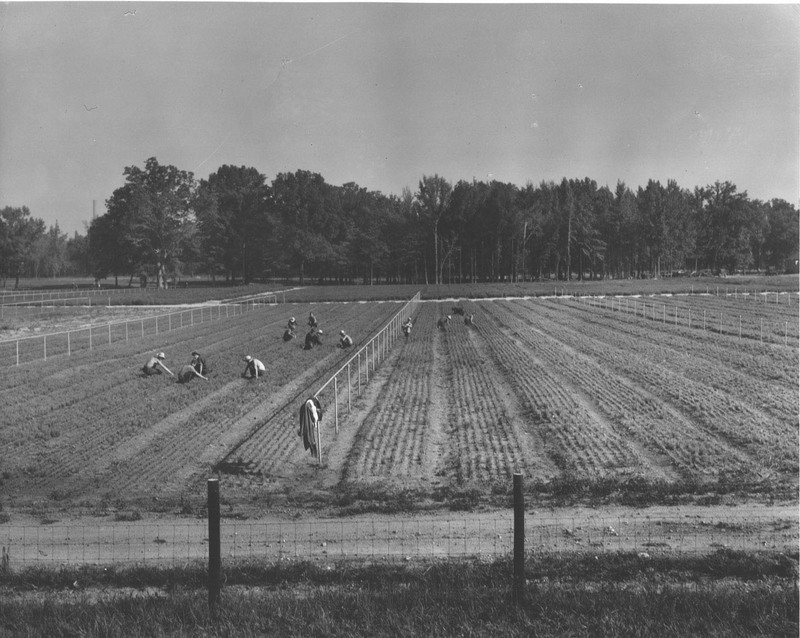 Laborers at work in Tennessee Valley Authority forest tree nursery at Muscle Shoals, Alabama. FDR Library Photo Collection. NPx. 53-227(1850). “I am a cripple, a Veteran of the Spanish-American war and the father of three boys in the Armed Forces. I have a feeling that the pride engendered by carrying one of your canes, a cane from your collection, preferably one you had carried and discarded, would vastly improve my stride.” – Joseph L. Delph to FDR, April 5, 1943. Throughout his Presidency, FDR received thousands of letters from the general public. Americans shared their reactions to Roosevelt’s speeches and policies, requested action on political issues, expressed support or voiced concern over the President’s approach to the New Deal and to the war effort. Some even requested financial or material support for themselves and their families. 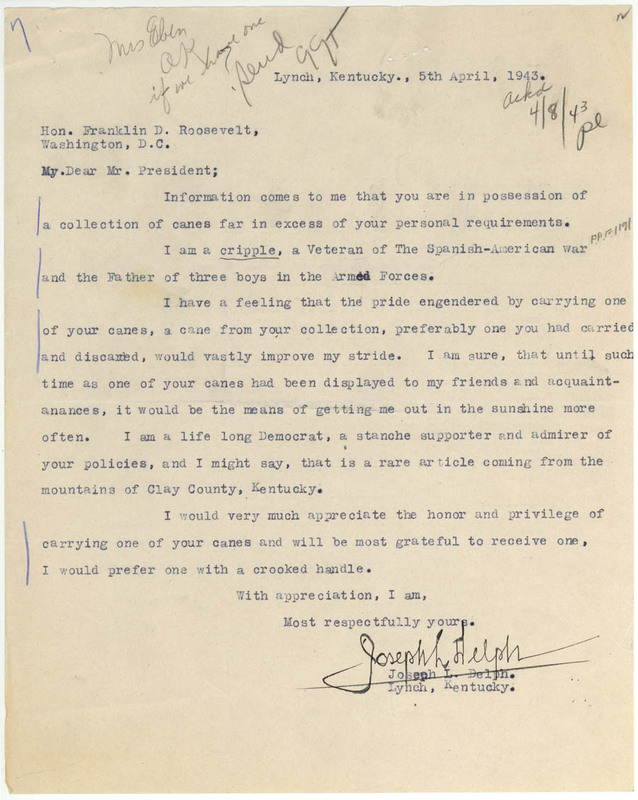 Read all four pages of correspondence related to this 1943 cane request. Materials were reproduced from FDR’s President’s Personal File (PPF) 50-d: Congratulations, 1943. After FDR’s death in 1945, Fala lived with Eleanor Roosevelt. He died in 1952 and is buried near the President and First Lady in the Rose Garden of FDR’s Hyde Park estate.